I have various groups set up for my organization to facilitate easier sending of emails to their members. Everyone is a member, except that I am an owner of these groups. Several others need access to be able to email these groups, but making them owners would mean they would receive future correspondence intended for the group. How can I allow only certain users to email a group, but not allow them to receive emails sent to the group? I am set up with an Education account; the additional Business features are not enabled. Create a user account called forwarding-user@yourdomain.com. Then make forwarding-user@yourdomain.com a member of your group group@yourdomain.com. Then for each of the individuals outsider@somedomain.com who need to email group@yourdomain.com create a filter in forwarding-user@yourdomain.com to foward their mail. When outsider@somedomain.com emails to forwarding-user@yourdomain.com, it is forwarded to group@yourdomain.com. Messages in group@yourdomain.com go to forwarding-user@yourdomain.com but go no further. For cleanliness, you could create another filter that deleted all the messages from group@yourdomain.com. Of course, this would be very cumbersome if you have a lot of outsider@somedomain.com users. The easiest method is to enable Also Allow anyone on the internet to post messages As you might guess, this will allow anyone to send messagse to the group without having to be a member of the group. Naturally this opens the address up to misuse as anyone outside of the organisation can email the group. The other option (I'm not sure if this is a Business apps only option) is to enable the custom settings, then under Who can send emails to the group, tick domain.com users. This will prevent misuse while allowing non-members to email the group. (though I suspect these options may not be available to you?). You can then add additional filters for additional senders, or use the OR filter command to add multiple people to the one filter. As of 2018, the interface has been updated. Not the answer you're looking for? 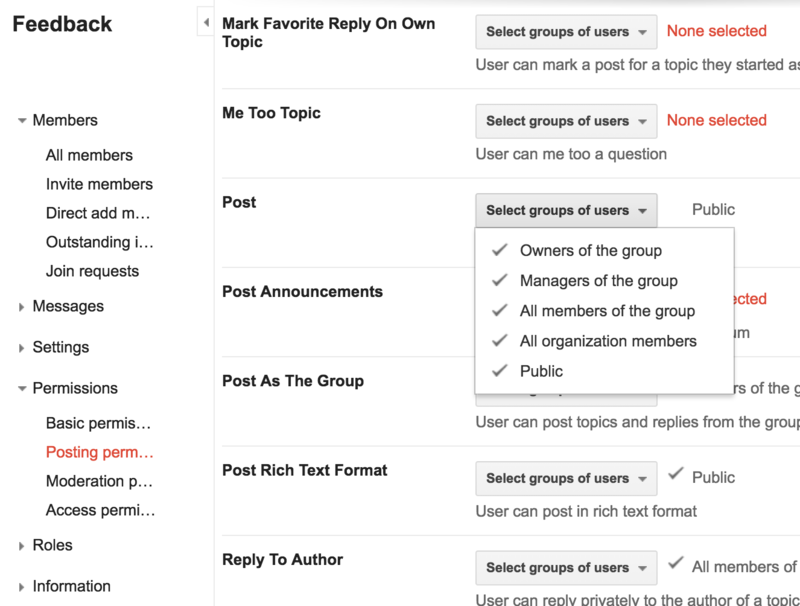 Browse other questions tagged google-apps google-groups or ask your own question.